to give panels that I wasn’t familiar with a fair chance. voices using a plastic sword. I don’t know what else to say about this. search of other things to do. of the convention that I was fortunate enough to catch. sound entitled, demanding or condescending, which isn’t my intent at all. left with a smile on my face, at least. Right now I’m in the middle of watching (and highly enjoying) Accel World, but despite its inventive sci-fi themes and unexpectedly plump protagonist, I’m a little annoyed and weary of the fact that it’s yet another high school-themed series, of which I’ve just about reached my limit over the past year. I’m well aware of why there are so many and why that’s unlikely to change any time soon, but for someone in their early 30s, the constant disconnect between my own reality and the lives and situations of the characters I watch and continually empathize with is a little disconcerting. I try not to put any stock in this (especially when it comes to the fantasy worlds of One Piece, Naruto, and other shonen series), but in the back of my mind, I can sometimes hear a voice telling me that maybe it’s time for me to move on and leave behind these high school-themed stories behind. Heck, I think the last “adult” series I watched was Planetes, which was almost two years ago, and since then I’ve been longing for another series to come along that might feature other characters who are closer to my own age. It’s not that I have a problem with high school series resonating with me as much as they do. Rather, I’m just bothered by the fact that they’ve grown as ubiquitous as they are and that the once-broad offerings of anime, which once seemed aimed at kids and adults, now seem exclusively crafted for a demographic that I’m no longer a part of. So Space Brothers, which arrives with an unexpectedly similar premise and a set of introductory themes as Planetes, couldn’t have come any sooner for me. 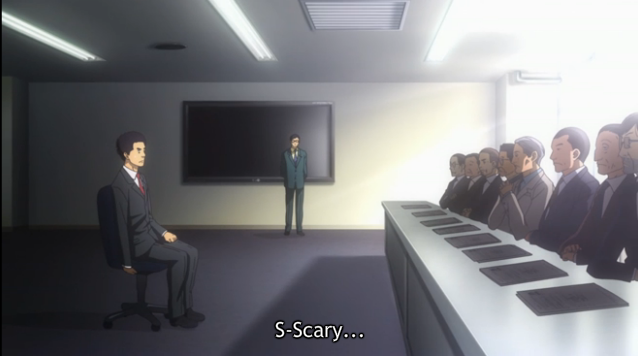 Not only is the series focused on adult-aged characters, but on a protagonist relatively close to my own age. What I found particularly relatable about him is that he’s in the middle of a major life transition, struggling with issues of identity and self-worth as he finds himself starting all over again. Mutta, a successful, 31 year-old engineer, is dismissed from his job, forced to move back in with his parents and undergo a humbling and unsuccessful hunt for a new job in his field. To make matters worse, he finds himself living in the shadow of his younger brother Hibito, whose promising career as an astronaut is about to take off. I don’t have any rivalry or feelings of “leadership” when it comes to my brother, but I still feel a great connection with this series. A year ago I left my full-time job and the apartment I’d been living in for 5 years to move in with my girlfriend’s family and go back to school full time. In a lot of ways this has been a positive change for me, but I’ve essentially had to start all over again and it hasn’t been the least bit easy, particularly since it’s meant giving up a part of my sense of self-sufficiency, and finding out that I’m the oldest “kid” in any of my classes (not that anyone can tell, but all the same it’s still a little awkward). So the initial conflict of this series (starting from scratch, competing with younger applicants) resonates with me a lot, as does the story that emerges as Mutta begins to revisit and take a chance on his long-abandoned childhood dreams. Mutta is a likable protagonist that viewers will empathize with, and already the show is revealing a very interesting supporting cast that I’m looking forward to getting to know in the coming weeks. 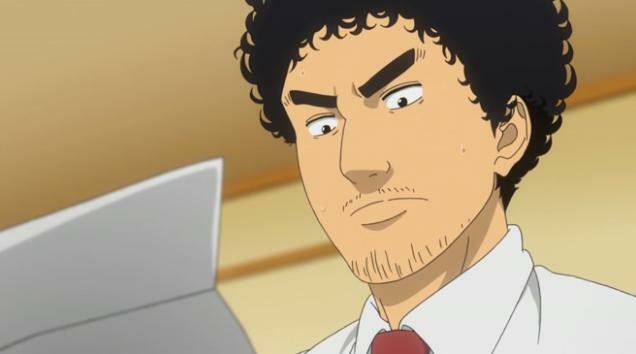 Will Mutta pass the astronaut exam? Will his fellow applicants, Kenji or Serika? Is Serika a Christian (I’m just intrigued by the possibility of any character in anime possessing any sort of recognizable faith)? Oh, I forgot to mention: this show is hilarious, too. Mutta’s regression from successful, independent adult to directionless boomerang child is tragic but still fun to watch, and viewers will either recognize themselves in his downfall or breathe a sigh of relief that it hasn’t happened to them. Space Brothers is a seriously promising series that seems poised to deliver big, I’m looking forward to taking my time with it and soaking it all in.